ShopKeep POS is a revolutionary POS System that gives merchants the power to run and analyze a business on an elegant, easy-to-use iPad. By combining an iPad register with our cloud-based BackOffice reporting, you have the ability to generate powerful analysis of inventory, sales and customer relationship management with a service that never becomes outdated. 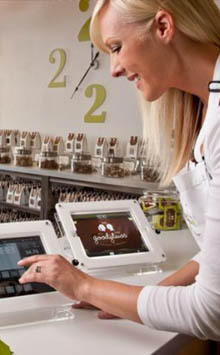 We believe an iPad POS should be beautiful and intuitive. No need to train your staff, the ShopKeep POS System is so easy to use you can start running your store in minutes. Ring up customers, print or email receipts, pop the cash drawer, accept credit cards, print to the kitchen, scan items, manage your inventory, update pricing and have real time access to sales numbers from anywhere. Try the demo, sign up, then go live in minutes. Have a question or concern? Call us. Our patent-pending POS system allows you to ring up sales even when the internet is down. When your internet is back up, all your data will sync with your personal store online. Our powerful reporting suite allows you to slice and dice your data easily and extract the information that is really meaningful to your business. ShopKeep POS is the simplest way to make smarter business decisions.